BSN, Avila College, Kansas City, Mo. Dr. Jane Bostick researches nursing home care quality items such as staff levels, staff turnover, the impact of environmental design on nursing home residents, and minimum data set quality indicators. She is also interested in cognitive assessment of nursing home residents and interventions to improve dementia and depression in older adults. Her dissertation research examined the effect of nursing personnel on nursing home care quality. Bostick, J., Rantz, M., Flesner, M. and Riggs, C. (2006). Systematic review of studies of staffing and quality in nursing homes. Journal of the American Medical Director’s Association, 7(7), 366-376. Aud, M., Bostick, J., Marek, K. andMcDaniel, R. (2006). Introducing baccalaureate student nurses to gerontological nursing: Increasing knowledge and positive attitudes. Journal of Professional Nursing, 22(2), 73-78. Bostick, J., Aud, M., Parker-Oliver, D., Schwarz, B., Tofle, R., Garrett, L. and Williams, S. (2006). Staff perceptions in Special Care Units (SCUs). Long-term Care Interface, 7(1), 12-17. Rantz, M., Zwygart-Stauffacher, M., Mehr, D., Petroski, G., Owen, S., Madsen, R., Flesner, M., Conn, V., Bostick, J., Smith, R. and Maas, M. (2006). Field testing, refinement, and psychometric evaluation of a new measure of nursing home care quality. Journal of Nursing Management, 14(2), 135-154. Aud, M., Parker-Oliver, D., Schwarz, B., Tofle, R., Ory-Hernandez, R., Bostick, J., and Finke, M. (2005). Social model care units for persons with dementia: A demonstration project, Alzheimer’s Care Quarterly, 6(4), 306-314. Parker-Oliver, D., Aud, M., Bostick, J., Schwarz, B. and Tofle, R. (2005). Dementia Special Care Units: A policy and family perspective. Journal of Housing for the Elderly, 19(1), 113-125. Bostick, J. (2004). Relationship of nursing personnel and nursing home care quality. Journal of Nursing Care Quality, 19(2), 130-136. Rantz, M., Mehr, D., Petroski, G., Madsen, R., Hicks, L., Bostick, J., Zwygart-Stauffacher, M. and Maas, M. (2004). Nursing home quality, cost, staffing, and staff-mix. The Gerontologist, 44(1), 24-38. Bostick, J., Riggs, C.J. and Rantz, M. (2003). Quality measurement in nursing: An update of where we are now.Journal of Nursing Care Quality, 18(2), 94-104. Rantz, M., Popejoy, L., Petroski, G., Madsen, R., Mehr, D., Zwygart-Stauffacher, M., Hicks, L., Grando, V., Wipke-Tevis, D., Bostick, J., Porter, R., Conn, V., and Maas, M. (2001). Randomized clinical trial of a quality improvement intervention in nursing homes. The Gerontologist, 41(4), 525-538. 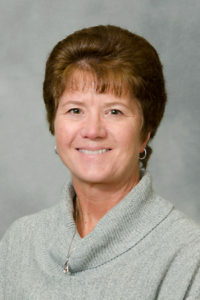 Jane Bostick is an associate teaching professor at the MU Sinclair School of Nursing. She is a current member of the Board of Directors of the Boone County Senior Citizens Services Corporation (The Bluffs). In 2000 she was appointed to the Missouri Governor’s Task Force on the Caregiver Workforce to examine ways to improve working conditions and decrease turnover of caregivers in nursing homes. Dr. Bostick is the coordinator of the Mental Health Nurse Practitioner graduate area of study and teaches mental health nursing at both the undergraduate and graduate level. She is nationally certified as a Clinical Nurse Specialist in Adult Psychiatric/Mental Health Nursing. “Best practices for advising on-line students,” MU Teaching Renewal Conference, University of Missouri, Columbia, Mo, February 23, 2006. “Effectiveness of social model care units for dementia.” [Paper presentation] 16th International Nursing Research Congress, Sigma Theta Tau International, July 14-16, 2005. Kona, Hawaii. “Where young meets old: A gerontological education-service partnership.” American Association of Colleges of Nursing (AACN) Baccalaureate Education Conference, Lake Buena Vista, Fla. November 16, 2003. “Quality of care and staffing in nursing homes.” 12th Annual Conference, Caring for the Frail Elderly, Missouri Association of Long-Term Care Physicians, Columbia, Mo, August 24, 2002. “The effect of nursing personnel on nursing home care quality.” 26th Annual Research Conference, Midwest Nursing Research Society, Chicago, Ill. March 3, 2003.